Middlesex University is pleased to be part of the Santander Universities Global Division, which was established in 1997. Santander Universities' aim is to support higher education as a means to contribute to the development and prosperity of society. Since 1997, Santander has donated over £500 million in the shape of scholarships, travel grants, support to special projects, academic and non-academic awards. In order for a business to apply for an intern, or for final year students and graduates to register their details for this fantastic opportunity, please contact the Middlesex University Employability Service employability@mdx.ac.uk or telephone telephone +44 (0) 20 8411 4923. Santander has provided a range of scholarships and awards to promote international exchange and study abroad and opportunities to enhance our international research profile. Santander is committed to encouraging and promoting enterprise at all stages of the business cycle and supports individual projects of redLoop, a research-led innovation and design collaboration centre run by the School of Science & Technology. redLoop brings together research expertise, social and ethical philosophies and commercial experience from across the University and its collaborative networks. 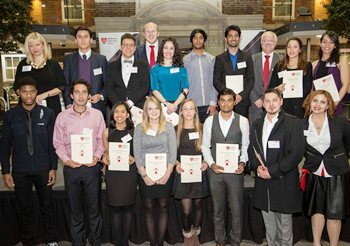 Enterprising undergraduates and graduates in the UK are invited to enter the Santander Universities Entrepreneurship Awards. These awards offer the top prize to the best business idea and evidence of its successful implementation offered to a panel of expert judges. Eligible applicants will need to own the business in question and alumni need to have graduated within the last two years.